Hello everyone. My name is Harry and on Friday I went to an event called Table Matters that was about ways to grow and share food with with everyone on the North Shore. I did a rough sketch about a compost project and once I looked at it I jumped 10000000 meters in the air!!!!!!!! (it was kinda hard to breathe.) It was a piece of genius!!! A piece of art!!! First you get a volunteer to find some worms (bigger is better!!!) and put them in a bike cart, and then go around collecting food scraps. Then the worms transform the food scraps into compost. When there is a good amount of compost you can go into town and sell it to gardeners! What do you think? Remember to comment! P.S. First 5 commenters (from Garibaldi School) will get a pack of sunflower seeds. P.P.S. (this is my mom) Thank-you to Harmony Garden on the Capilano Reserve for the seeds. The Harmony Garden is growing food and medicine to promote healthy living. The gardeners are also working to restore the estuary because gardens need healthy wild places to thrive. worms are awesome. great blog post harry! also an amazing drawing, TOTALLY a piece of genius artwork! looking forward to hearing more of you worm adventures. 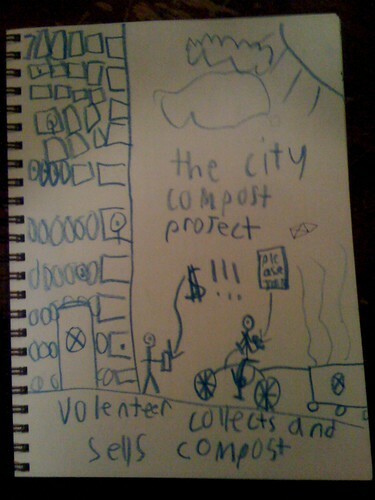 I love your composting idea, and wish I could jumps as high as you. You are right a genius and an artist-this post is awesome. And I have always believed celebrating one’s self in a public blog they maintain is the highest form of art. Nobody like the Hava-NOBODY! Harry, you’ve got it all figured out. When you’re ready to enter the workforce, I’ll hire you! Thanks for coming out on Friday! Good work Harry! Let us know when you have a drawing for the political part. Great to have you at Table Matters! Harry, this is one of the most genuisy-geniuslike artworks that I have ever seen. And a good idea, too. i think it will work very well. P.S. DO IT!!!!!!!!!!! Your a genius. Its a good idea with the worms. Its an even better idea with selling it to gardeners! Harry, I love your idea! It woud enprove alot.I espeshaly like that you get to ride a bike. composting is very important. It helps the plants grow. HARRY,I LOVED YOUR IDEA. BECAUSE I LIKE THE IDEA OF GETING THINGS FOR THE COMPOST AND I THINK IT WILL WORK. This is by far the best blog post (including comments) that I think I’ve ever read (and yes, I have read you Groom). I’m am flabberghasted with admiration! This is Harry. Here are the winners of the sunflower seed contest! #5, Adrian! Thanks again to Harmony Gardens and the Squamish people for the sunflower seeds!!!!!!!!!!!!!!!!!!!!!!!!!!!!!!!!!!!!!!!!!!!!!!!!!!! This is Harry again- I will give out the seeds on Friday. This is Harry again again. I’m sick today (Friday) but should be better Monday. I’m sorry for this last minute change-in-date. everybody! (this harry again. )I WANT MORE COMMENTS!!!!!!!!!!!!!!!!!!!!!!!!!!!!! (now please)!!!!!!!!!!!!!!!!!!!!!!!!!!!!!!!!!!!!!!!!!!!!!!!!!!!!!!!!!!!!!!!!!!!!!!!!!!!!!!!!!!!!!!!!!!!!!!!!!!!!!!!!!!!!!!!!! !